Despite mayor Bill de Blasio’s plans to spend on new initiatives like retraining police officers and providing mental health care for jail inmates, the city’s Independent Budget Office (IBO) predicts that the city’s fiscal health is in good shape for the next few years of the mayor’s administration. The IBO released its fiscal outlook report on Tuesday, predicting that the city will end this fiscal year (July 1, 2014 to June 30, 2015) with a surplus of $744 million, $639 million more than estimated by the mayor’s office. If the city spends its surplus upfront to pay for some of next year’s expenses, the IBO projects that year 2016 will end with a deficit of $184 million. That amount is small compared to past city budget deficits, such as the $2 billion shortfall in 2013 under mayor Michael Bloomberg. By years 2017 and 2018, the city will gain small surpluses of $420 million and $214 million respectively, according to IBO estimates. The mayor’s office anticipates shortfalls exceeding $1 billion for these years. The relative fiscal health is mainly due to growing tax revenues from business income, personal income, and property taxes as the local economy continues to recover from the recession. Tax collections are projected to grow at a rate of 4.7 percent annually, while spending will grow by 2.9 percent annually. The IBO predicts tax revenues will total $49.1 billion this fiscal year, an increase of 3.4 percent from 2014. By 2018, tax revenues are expected to hit $56.4 billion. Compared to the projected spending that the mayor announced for new programs, such as retraining police officers, the tax revenues will keep the city’s budget mostly in the black, the IBO predicted. This year, the city is spending an extra $237 million on the new programs, with similar amounts projected for the next few years. However, the IBO warned about potential red flags in the city’s spending that could balloon in the coming years. For one, the de Blasio administration has been out-spending its budget for sheltering the city’s homeless. For this fiscal year, the mayor added $105 for family shelters, bringing total spending on these shelters to a record high of $574 million, according to the mayor’s financial plan released in November. For the next few years, until fiscal year 2018, the plan includes an additional $45 million each year for family shelters. Based on the growing figures, the IBO predicts that the city’s spending on its entire homeless shelter system will soon fall further short. The cost overruns are due to a failure on the part of the city to negotiate substantial savings from contractors who provide temporary homeless shelters in hotels and other sites. The IBO also noted that the city has yet to settle contract negotiations with many of its uniformed workers in the police, fire, sanitation, and corrections departments. The city could end up paying more than anticipated in the city’s budget if the contracts yield high salaries and benefits for the workers. 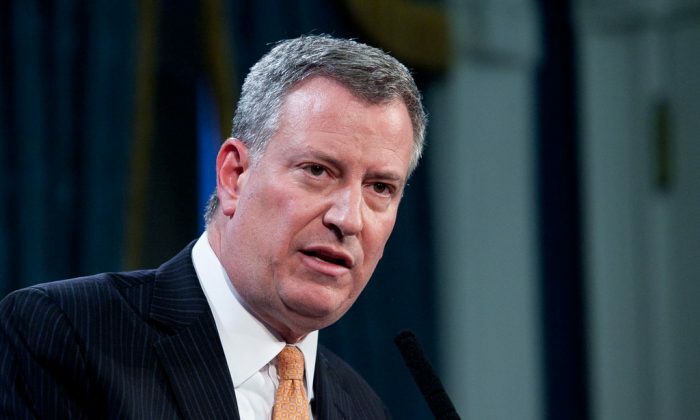 A number of city agencies, like the New York City Housing Authority (NYCHA), which runs public housing, and the Health and Hospitals Corporation (HHC), which runs public hospitals, also continue to have revenue shortfalls. The IBO predicts that the city will need to keep providing extra money to these agencies to keep them afloat. On Tuesday afternoon as the leaves change color, Bill de Blasio and his wife, Chirlane McCray, voted in their district in Park Slope Branch Library.